Achieving the goal of the participant that will navigate and the safety of the safety of the participant student and the crowd around the area will always be first than the passion of the sport by taking the basic security methods seriously. Those rules are necessary for a good healthy practice of the sport. 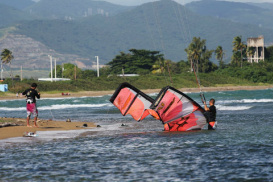 The approach of Guayama Kite boarding school is security. The Guayama kite boarding school invites you. Focus on safety and proper handling of the equipment. Basic lessons to control the kite include theory, security, control techniques, power zone, simulation to start in water and the techniques of the area that we practice.